By Livia Caroline Neves | Translation: Christine Di Stefano. Saquarema, the place to be happy and to love! This is the slogan of the Carioca paradise located just 72 miles outside of the city of Rio de Janeiro. Originally, Saquarema was a site belonging to the Tamoio Native Indians and during the 19th Century, the region became an important local with the coffee boom in Brazil. Nowadays, the town has been “rediscovered” by hippies and surfers, and has become a hotspot for both traditional tourism as well as those seeking some adventure outside of the city limits. Saquarema is a place of singular beauty, with the Atlantic Ocean on one side, and lagoons, plains, and mountains on the other. This small town has received the enviable titles of the “Surf Capital of Brazil” and the “Maracana of Surf” due to its perfect waves of indescribable beauty and strength. Few places in Brazil have waves the size of those at Saquarema, and because of this, in the 70s when surfing began to gain popularity in Brazil, it was the site most often chosen to host the most famous national surfing festivals in Brazil. The best beaches for surfing are “Praia de Itauna” and “Praia da Vila”, where even in the open sea the waves can easily surpass 9 feet. In total, there are almost 40 miles of crystal clear water, with 12 different beaches, both sea and lakeside, great for all kinds of outdoor adventures in addition to surfing. There are fishing competitions, jet-skiing, diving, sail sports, and water-skiing. All along the beach, there are kiosks (Brazilian Style, selling natural coconut water, acai bowls, and for sure, beer and appetizers) that have become meeting points for beach goers. Adding to its reputation as the town for adventure sports, there is also a ramp for “free flight” near Sampaio Correa beach, a motocross track in Itauna beach, and the Brazilian Volleyball Training Center. 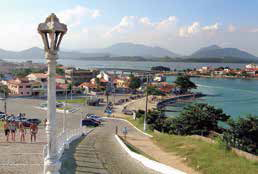 Saquarema has a great infrastructure that is easily navigated by all kinds of visitors, as well as typical cuisine and historical monuments. One of the most impressive tourist attractions is the Church of Our Lady of Nazareth that was build in 1630, and is the patroness of the city. The church is also known as one of the best places to catch a beautiful sunset, instilling a feeling of peace, happiness, and freedom. 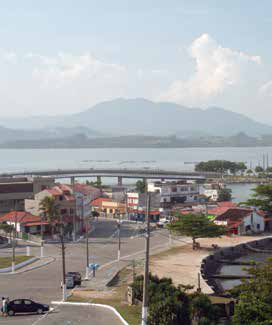 Other points of interest are: the Maritime Cemetery; the grotto of Our Lady of Lourdes; the lookout from the “Morro da Cruz”, the lagoons of Jaconé, Vermelha and Jacarepiá; the Mato Grosso mountain range and various archeological sites known as “Sambaquis” – which contain valuable records of the inhabitants who lived there thousands of years ago. It is a rare and true seaside paradise; a place ruled by leisure where one can do everything or nothing at all! Thus it is the perfect place for those who are tired of working and need a break, whether it’s for a weekend or for a full vacation. It’s a great option for those who want to spend their time doing nothing, completely out of touch with the “real world” of work and stress, where one can try their luck at line fishing or trawl fishing, as there is an abundance of fish, shrimp, and crabs, depending on the season. The town is also known as a great alternative to the traditional Carnaval in Rio, as one can enjoy all the beauty that nature has to offer and also the Saquarema Carnaval. * The Feliciano Soares da Silva Tourist Center (CA T) is there to assist tourists with any questions they may have, and also serves as a valuable source of information about artistic, cultural, and gastronomical attractions. This air-conditioned space also has a display of wines, music and art, as well as pamphlets containing original photos and statistical data about the city.